Saturday’s El Camino Real Derby is the lone graded route in Northern California’s road to Kentucky Derby 2012 and Daddy Nose Best should offer a hint of value for Steve Asmussen. #1 Daddy Nose Best (9-2) began his career splitting a pair of subsequent stakes winners (Exfactor, Dullahan) in a Churchill dirt sprint. He disappointed second time out but started to hit his best stride with added ground on the turf. Asmussen won this with Silver Medallion last year and that one also exited Santa Anita’s grassy Eddie Logan Stakes. Leparoux strings along and he shows five works for this. #6 Lucky Chappy (7-2) brought strong Italian form to Keeneland for his US bow last fall and was hardly disgraced in a G3 Bourbon show finish. He followed that up with a troubled 4th from post 11 in the Breeders’ Cup Juvenile Turf and prepped for this with a runner-up effort in the Jan 21 Kitten’s Joy Stakes at Gulfstream. The Graham Motion trainee is a late running threat if he handles the Tapeta footing. #7 Handsome Mike (8-1) is an interesting price player. The versatile SoCal shipper finished 4th in the G3 Sham (dirt), 7th in the G1 CashCall Futurity (synthetic), and 2nd in the G3 Generous (turf). He dons the hood and looms a pace factor at the very least. #10 Lady of Fifty (5-1) is a filly taking on the boys and she might be the best local hope. She ran faster than the gents in the Cal Oaks but seems most effective on the lead and meets other speed. She must overcome the outside post but her task is not impossible. #4 Russian Greek (5-2) is 2-for-2 in local routes and exits a fine late running score in the $100,000 Cal Derby. His numbers are a bit light but the $100k Keeneland sales grad packs a decent late kick and will be finishing for the productive Gryder-Hollendorfer team. 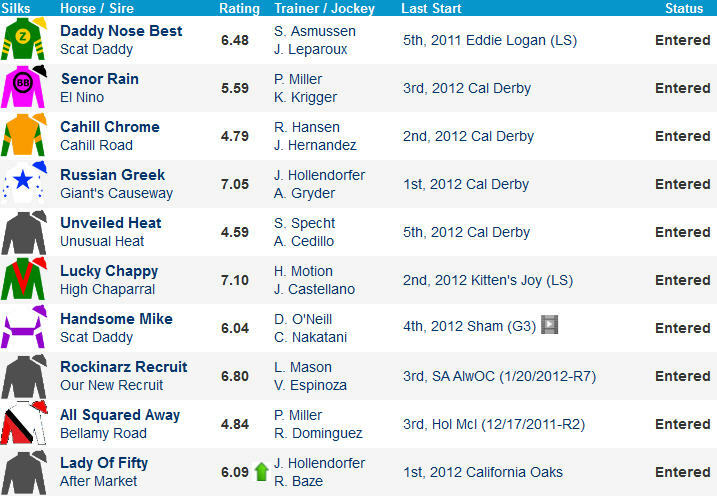 #3 Cahill Chrome (10-1) was tagged in a surprise place finish in the Cal Derby. He owns fine early-pressing speed and likes this oval but is probably a cut below the best in here. #2 Senor Rain (12-1) finished an even 3rd in the Cal Derby and will need to show more to make a dent in this tougher event. #8 Rockinarz Recruit (20-1) stretches out in distance and will probably show speed. He remains eligible for an entry level spot and is probably in over his head today. #5 Unveiled Heat (20-1) broke his maiden on turf in his 9th career start. He finished 5th in the Cal Derby at 18-1 and looks like an outsider in this spot. #9 All Squared Away (20-1) broke his maiden in a local route Jan 22 but he controlled the pace that day and did not earn much of a number. He is overmatched in the paper race.